All eyes are on Sidney Crosby and his concussion issues as he tries to hoist the Stanley Cup for the third time. But, once the season ends, many Canadians will turn their attention to the soccer pitch. 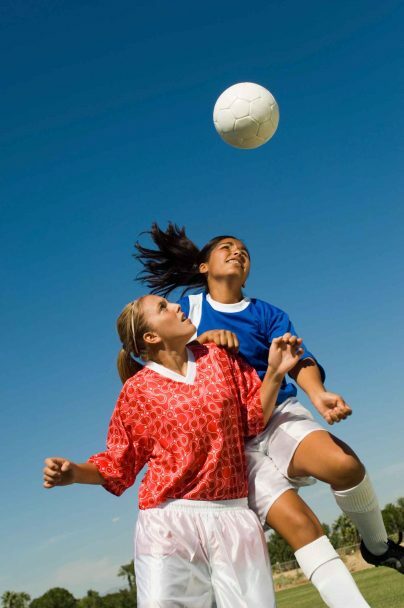 Despite hockey being our national pastime, soccer is the most popular team sport among youth athletes in Canada and around the world,1,2 but few are aware of the risks for concussion on the pitch. Anyone who has played the “most beautiful game” will tell you there are times when it’s not so beautiful. At every level, players are elbowed, tripped, kicked and head butted by team members and the opposition. One common misconception is that a concussion is always caused by a hit to the head; however, it is caused by acceleration or deceleration of the brain following a significant impact to the head or elsewhere on the body. Even a slide tackle to the legs could result in a concussion if it results in enough acceleration in the brain. Studies on American football players found concussion impact magnitudes to be 70 to 120 times the force of gravity or G’s. Research shows that G-forces of soccer headers are often low accelerations – about 15 to 25 G’s. In most cases, this is not enough force to cause a concussion in teenage or adult soccer players. Studies show that head size is 90% fully grown by the age of 4. A low body weight and underdeveloped neck muscles can make the head and brain more susceptible to acceleration and deceleration. These factors as well as less experience bracing for impact when heading the ball increases the risk for concussion in kids’ soccer. Given a developing brain is more vulnerable to the effects of concussion, we recommend limiting intentional headers at younger ages. CCMI works with a range of sports organizations to develop concussion policies at any level. Although not required for all athletes, concussion baseline testing provides a pre-injury overview of healthy brain function before the season starts. This information may help healthcare practitioners make safer Return to Learn and Return to Play decisions should your child suffer a concussion on the soccer pitch. For more information or to book a baseline test click here. 4 Comstock RD, Currie DW, Pierpoint LA, Grubenhoff JA, Fields SK. An Evidence-Based Discussion of Heading the Ball and Concussions in High School Soccer. JAMA Pediatr. 2015 Sep 1;169(9):830.